Guys, I'm speechless. I know. Me? Speechless? 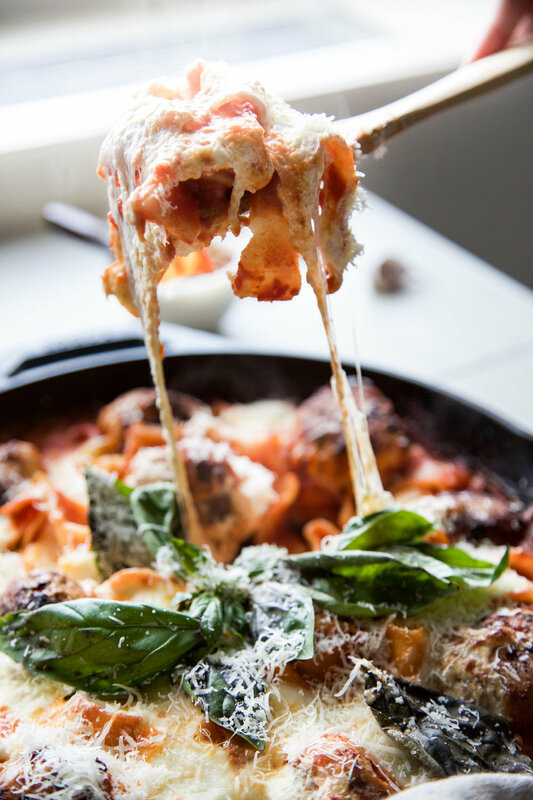 It's rarer than a unicorn spotting, and yet that's exactly what this one pan chicken parm meatball & burrata pasta bake does to me. It leaves me speechless. It's just that darn good. Let's dive into all the cheesy deets, shall we? Chicken parm is a classic favorite, but breading it in one bowl, frying it in one pan, making sauce in another and cooking up pasta in yet one more, is far too much for a weeknight meal around here (and I'm guessing around your home, too). 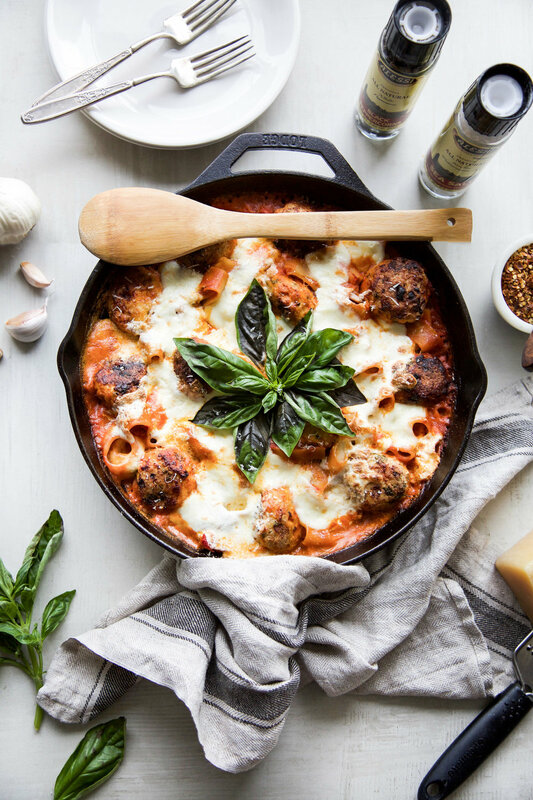 But chicken meatballs, a little help fromAlessi's marinara sauce and everything cooked in one pan? Now that I can do. 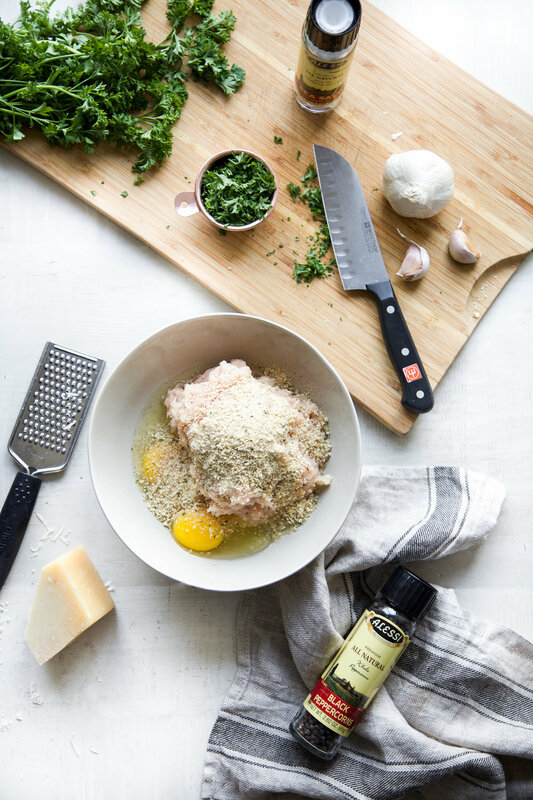 The chicken meatballs themselves pack in a lot of flavor, between fresh garlic and parsley, Alessi Salt & Pepper, fresh grated parm, and, are you ready for this fun little surprise, mozzarella tucked away inside! 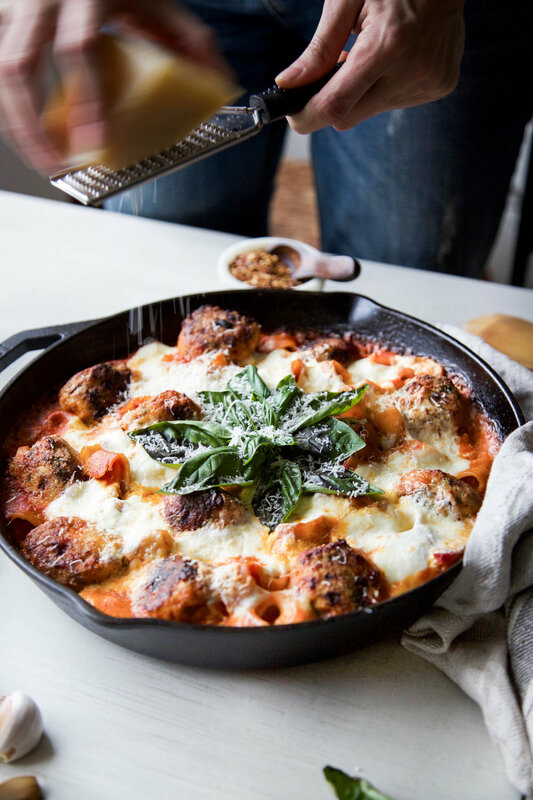 I mean, call me biased, but these cheese stuffed meatballs alone have me thinking that this version of chicken parm is far more delicious and exciting than the original. But don't tell my Italian grandmother that! After the meatballs have been browning, they get removed from the pan for a hot minute, then the sauce gets tossed in along with some chicken broth, water and pasta. I love using Alessi's Organic Mezzi Paccheri, as the shape is hearty enough to stand up to sauce, meatballs and cheese, but not so big that it will take too long to cook (a priority for a one pan recipe). Alessi uses wheat grown right in the heart of the highly nurtured fields of Italy, combined with fresh spring water, to make their pastas that are then pressed through bronze dies (aka stamps used to make various pasta shapes...the bronze dies help to create a more porous texture which in turn helps the pasta absorb sauce more efficiently which in turn means your meal tastes more delicious). It's a difference you can truly taste (and this is coming from a girl who likes to make her own pasta). 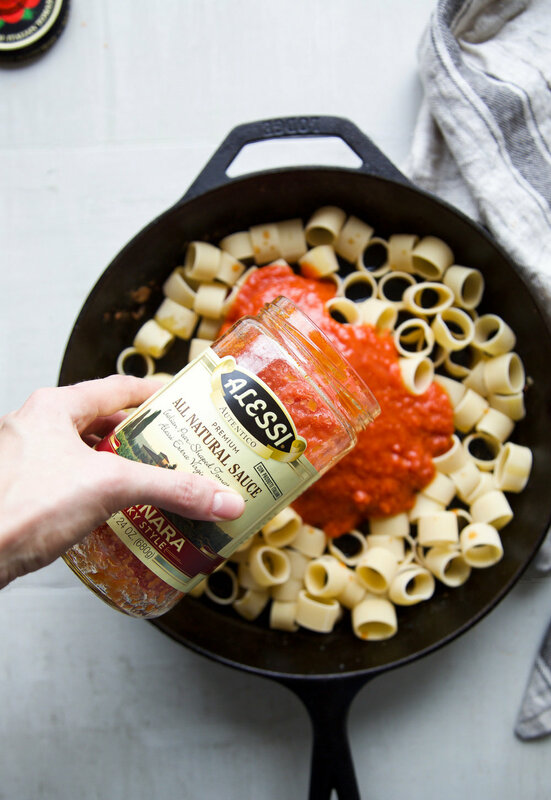 FYI, you can find Alessi selection of pastas, sauces and other products in at your local grocery store, or you can order directly online here. Once the pasta is in, the meatballs go back on and into the oven the pan goes. Right before it's finished baking, everything gets topped with a hearty amount of mozzarella and, my favorite, burrata. I mean, talk about cheesy, heavenly goodness, right?? Immediately before serving, finish off with some fresh basil, and, because you can never have too much cheese, some fresh grated parm. I promise, you'll be left speechless, too. Add all meatball ingredients to a large bowl. Use your hands to mix everything together. Then shape into 12 large meatballs, stuff each with a small mozzarella ball or piece of mozzarella (reserve any extra mozzarella for later), making sure to mold the meat around the cheese so that it is fully covered. Heat a 1 ½ tablespoons of olive oil in a large (10 inch) cast iron skillet set over medium-high heat. Add the meatballs, 3 or 4 at a time, cooking for a few minutes on each side, until they are brown. Remove to a plate, and continue until all meatballs have been cooked, adding more olive oil if necessary. Meanwhile, begin preheating the oven to 400 degrees. In the same skillet used for the meatballs, add the pasta, sauce, water and chicken broth and stir to combine. Place the meatballs on top of the pasta. Bake for 35 minutes, stopping to stir several times. After 35 minutes, top with burrata and any remaining mozzarella. Bake for 10 more minutes (if you want your cheese to get golden brown, you can broil for 2-3 minutes right before removing the skillet from the oven). Remove from the oven and let rest for a few minutes. Top with fresh parmesan cheese, basil and red pepper flakes and serve. Thank you to Alessi for sponsoring today’s post.